An RL10 rocket engine, a proven upper stage engine used in hundreds of space flights over the last 50 years, goes through testing at NASA's West Palm Beach, Florida test facility. What could be mistaken for a futuristic water cannon is actually a piece of technology developed more than 50 years ago that is destined to help launch NASA's next megarocket, the Space Launch System. The RL10, a rocket engine developed in the 1950s by Pratt & Whitney, flew first in 1963. This engine has traveled to each planet in our solar system, powering spacecraft such as Voyager 1 — the first to reach interstellar space. Because of its stellar record and its technically mature design, this rocket engine will make its way from the history books into the future of human spaceflight. NASA's new Space Launch System, or SLS for short, will utilize this upper stage engine to launch an Orion spacecraft in the latter part of 2018 as well as eventually sending astronauts beyond the moon. Aerojet Rocketdyne of West Palm Beach, Florida will produce several RL10C-3 engines for NASA, powering its several planned deep space missions, with the ultimate goal being NASA's Journey to Mars. 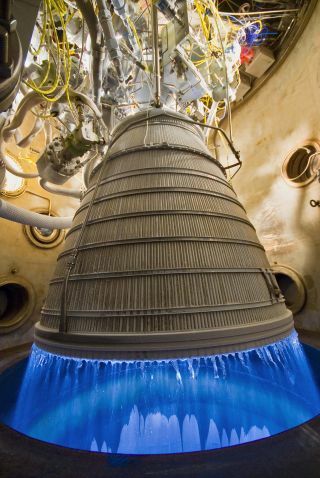 According to James Burnum, NASA SLS Liquid Engines RL10 manager, "Engines are one of the most complex rocket elements … We need a reliable engine with a proven track record that has the performance to power humans to deep space." Using the RL10 "leverages existing propulsion technology to provide SLS with a robust engine in a timely manner [avoiding] costs associated with a new engine development program," added Steve Wofford, SLS Liquid Engines manager at NASA's Marshall Space Flight Center in Huntsville, Alabama, where the SLS Program is managed. The $174 million, 8-year contract leaves Aerojet Rocketdyne responsible for the management, testing (at NASA's West Palm Beach, Florida test facility), certification and delivery of the engines. Follow us @Spacedotcom, Facebook and Google+. Original article on Space.com .